Apple's new iBook service lets authors self-publish, but as one author found out you better not link to Amazon in your text. Seth Godin's iBook submission was rejected by Apple not because he had objectionable material, but because he linked to Amazon's bookstore. We've seen similar policy with iOS apps not being allowed to point to an outside link to purchase a subscription (effectively getting around Apple's cut), but keep in mind that Mr. Godin wasn't linking to his own book on Amazon. The links were to reference material used in his book, and they pointed to printed editions of the books that aren't available in digital format or from Apple. iBooks is a very cool way for authors to get their work out that otherwise couldn't, but this is just another example of Apple ruling their ecosystem with an iron-handed, irrational fist. They ban apps that compete with features they have (Evi banned because of Siri) but not across the board. It's a pick and choose system they use. Google books doesn't let you import any books at all.... but lets ignore that fact. none of them let you import books from other services. they are not compatible. they are not in the same format. its not possible. the issue isnt importing books. read the article before commenting.. geesh. OMi'FG, love that photo soooo much I am going to use it as my Avatar (with iPermission of course). No surprise on the iKremlin, though. 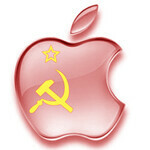 Love, love the Apple Logo with a hammer and sickle over it. Not good Apple, not good. I agree, that avatar is great. where have all the local idefenders gone? they should be touting how this is an exellent move or something. to the rest of us, its not surprising. I like Apple product to a certain extent but this is honestly undefendable. This is something you see only in totalitarian communist regimes. Shame on them! I want an explanation otherwise there will be no "magic" excuse to make me buy their products again. Actually it's the kind of thing you see in just about every company where conflict of interest is an issue. Comparing companies to governments makes no sense. "Mr. Godin wasn't linking to his own book on Amazon. The links were to reference material used in his book, and they pointed to printed editions of the books that aren't available in digital format or from Apple." Read above, conflict of interest? That can be called censorship and that's what totalitarian regimes do. Union Of Soviet Applelist Republics. Apple,tear down that wall!!! Wait, let me get this straight. People are complaining about Apple not allowing Amazon links in books sold in THEIR bookstore, which can only be accessed on THEIR devices. Sorry Apple haters, there's nothing ridiculous about this. They don't want competing ADVERTISEMENTS in the products THEY SELL. "Mr. Godin wasn't linking to his own book on Amazon. The links were to reference material used in his book, and they pointed to printed editions of the books that aren't available in digital format or from Apple." You too, read above. Amazon sells everything including Apple products.